First responders in Emergency Medical Services (EMS) are ten times more likely to contemplate suicide than the national average. The most common reasons responders leave the field are burnout and psychological trauma as a result of repeated exposure to traumatic events. In partnership with the Code Green Campaign and Mutual Aid Disaster Relief, this project will develop a live original performance exploring experiences of trauma in EMS providers. It will receive its first work-in-progress production in March 2019 at Yale University in New Haven, CT, in conjunction with a Yale Public Health masters thesis. 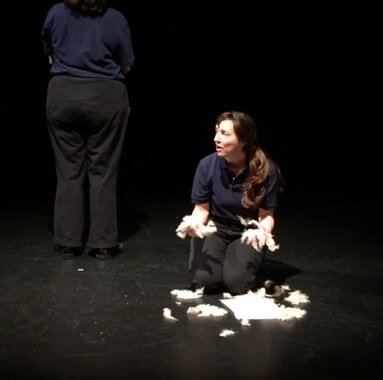 Initially workshopped during a residency at the CoHo Productions Summer Workshop Lab in Portland, OR, this ongoing collaborative process will explore experiences of first responders struggling with and finding paths through trauma. Its continued development draws on interviews, anonymous stories, artwork, physical improvisation and the artists' experience as health workers and creators of collaborative performances. It will be accompanied by a written thesis by director Taiga Christie examining new methods of supporting first responders. We are looking for collaborators in the New Haven area! Regardless of experience, we encourage anyone interested to reach out about working with us. We especially hope to work with emergency medical and disaster responders, regardless of artistic experience. Please get in touch, and help us by spreading the word to others. We are exploring options for more performance and rehearsal venues, as this project continues into the future. If you have space in the New Haven area to offer or rent, please get in touch – we hope to find affordable and accessible venues to serve as homes for this performance's next iterations. Get in touch to share a story or opinion. We are actively conducting interviews, seeking script feedback and recruiting editors in order to incorporate a wide range of perspectives and input. We welcome your ideas. This project was originally conceived by Taiga Christie and Faultline Ensemble with the support of the CoHo Summer Workshop Lab residency in 2016. We receive funding from the Network of Ensemble Theatres Travel Grant program, the InnovateHealth Yale Fund, the Tsai CITY Center, the Schell Center for Human Rights at Yale Law, the Yale Public Health Social and Behavioral Sciences Research Fund, and the Yale MacMillan Program on Refugees, Forced Displacement and Humanitarian Responses. Our March production is made possible with the support of the City of New Haven Mayor's Community Arts Grants Program. We draw inspiration from the fields of community-based performance, narrative medicine, physical performance, trauma stewardship, drama therapy and theater of the oppressed. The project hopes to validate the unique struggles of first responders, and to celebrate the resilience, cohesion and pride that exist in the first responder community. Thank you for your interest – please be in touch! We will contact you for explicit permission before using anything you submit in our work. Please share ideas, stories, comments, or request more information on being involved.